One of my students' favorite economic botany labs deals with fruit diversity. Probably at no time previous have so many different fruits been available in ordinary temperate zone markets. Although the Phactor managed to find quite a few interesting fruits, there were several disappointments. Tamarillos, which had been around for several weeks, disappeared. Drat! The pitiful excuses for pineapples were picked way too green as were the custard apples. However the mangoes and orange papayas were in great shape. Kiwanos and passion fruits were the most unusual from the student perspective, both having fleshy seed coats as their edible part. This year's surprise favorite was carambola. And big surprise, most of them tried most of the fruits without being cajoled to do so! Sometimes peer pressure can be a positive thing. 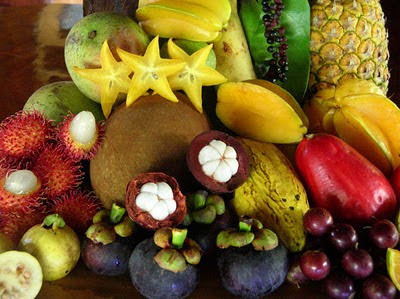 After so many years of prowling tropical markets around the world new fruits are a rare event for the Phactor. Oh, yes, tried all of these. Out of this group the mangosteens are my favorite. High marks for color and composition there - and high jealousy here, since getting anything more exotic than a banana is a rare event here. Ah, yes, but the complements belong to whomever took the picture and allowed me to pinch it from the web. A fairly high southern Asian population helps maintain such exotic faire in our markets, but not rambutan, mangosteen, or sapote, although the Phactor did find rambutan at Jungle Jim's . It's worth a field trip. But on the subject of fruit, when I was a Hoosier (in the '30s) I could eat pawpaws. Now there's a great fruit that only midwesterners can enjoy. Mangosteens are delicious, but have two problems: they are usually expensive, and as far as I know it is not possible to determine if they've gone bad, short of opening one up. If you really want to up the diversity, bring in some jackfruit and durian. Somehow I don't think peer pressure is enough to get students to try durian!